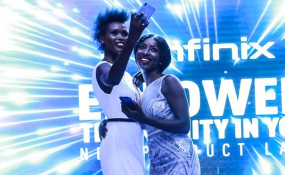 Models display the new Infinix S4 during the launch in Nairobi. Infinix Mobile has officially launched its latest device, the S4, in the Kenyan market in Nairobi. The S4 comes with a premium glass finish, three cameras at the back, a 32MP AI selfie camera that is packed with the latest AI imaging techniques. The S4 also comes with a 6.2' water drop display screen, a triple rear camera for much better portrait images, super-fast octa-core chipset, a large 4000mAh battery power and additionally comes with XOS 5.0 out of the box. On the front, it has minimum bezels with the new water drop notch and on the back it has the square fingerprint reader. S4 runs on XOS v5.0 Cheetah on top of Android 9.0 Pie which is a first for Infinx. One will have the option of getting either the 3GB or 6GB of RAM with MediaTek Helio P22 processor coupled with 32GB or 64GB of onboard storage expandable to 128GB via a microSD. The 4GB (RAM) version has a suggested retail price of Sh14,999 while the 6GB variant will cost Sh18,999. The phone comes in a variety of colors including Milan Black, Blue and Purple and are available online on Infinix Mall and in offline Infinix retail shops. During the launch, Infinix said they want to build a community between consumers and the company, to help with their innovation story because they want to push more affordable devices with premium specs, and designs. The company continues to focus on the selfies camera with the S series coming in a competitive budget category that is dominating the Kenyan smartphone market. Livingston Migwi, Chief Business Operations Officer Transsion East Africa told Nairobi News that they just launched an Infinix concept store in Morocco, aptly named Infinix Spark where staff, partners and customers will get to experience Infinix current and new products and that the company was also looking forward to introducing the same concept in the country. "Infinx brand has grown not only in Africa but in East Asia and in the Middle East operating in Nigeria, East Africa, Indonesia and in Dubai, UAE and we look forward to many more years in the region," said Mr Migwi. Regarding security and privacy of their devices in Kenya, Migwi said, "We have been in the Kenya for seven years and we value our customers privacy and that the company will never do anything to jeopardise it." The device features a beautiful 6.2 inch HD display with a resolution of 720 by 1500 pixels with 2.5D glass covering on both the front and rear of the phone.